VANCOUVER , July 11, 2018 /CNW/ - IsoEnergy Ltd. ("IsoEnergy" or the "Company") (TSXV: ISO; OTCQX: ISENF) is pleased to announce that it has extended the Whitewater property ("Whitewater") and added a new property called Whitewater East. Both of the new claims are located in the Athabasca Basin region of Saskatchewan , and both were acquired by staking. The new 100% owned claims were acquired to cover areas of historic uranium mineralization following ongoing compilation efforts by IsoEnergy's technical team. Steve Blower , Vice President of Exploration at IsoEnergy, comments: "I'm excited about the uranium discovery potential on these new additions to our Whitewater area land holdings. Each of the new claims covers a large number of uranium showings with numerous mineralized grab samples and a paucity of drilling. They are highly prospective for large-tonnage, near-surface uranium deposits." Craig Parry , President and CEO, comments: "I'm pleased to report that we continue to add to our highly prospective portfolio of Athabasca properties at very low cost. 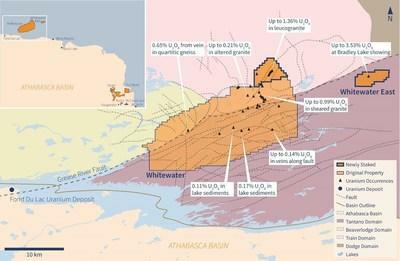 Our Whitewater properties cover an area of prospective ground that has many of the hallmarks of the Paterson Lakes South Uranium District which hosts our major shareholder NexGen Energy Ltd.'s world-class Arrow deposit. These characteristics include a significant near-by deposit at Fond du Lac , numerous areas of uranium mineralization at surface on the property, shallow or exposed basement host rocks and the presence of major host structures and fluid pathways. We look forward to commencing exploration on these properties in the coming months." The original Whitewater Property was staked on January 16 th and consisted of 15 contiguous claims totaling 25,966 hectares located along the northern rim of the Athabasca basin. Whitewater covers over 26 kilometres of the Grease River shear zone which separates the Beaverlodge , Train and Dodge domains to the northwest from the Tantato domain to the southeast. This prominent, long-lived, crustal-scale structure is known to host Athabasca basin related uranium mineralization at the nearby Fond du Lac deposit 26 kilometres along-strike to the southwest. The entire Property is located just off-basin, therefore there is no sandstone cover. At its closest point, the Whitewater Property boundary is within 5 kilometres of the edge of the Athabasca basin. An additional, contiguous, 1,562 hectare claim was staked in May to more completely cover a group of uranium occurrences that extended off of the original property to the north. Figure 1 shows the location of the new claim. Uranium in this area is commonly hosted by outcropping white leucogranites around the outside of a granitic dome. One particularly well mineralized section has a strike length of approximately 1,500 metres, based on airborne and ground radiometrics. Historic grab sample grades in the area returned up to 1.36% U3O8. Drilling in the area consists of only one, six-hole drilling campaign completed over a small, 350 metre portion of the mineralized trend. All six drill holes were mineralized, with the best result being 0.021% eU3O8/24.2 metres. In addition, a single 1,147 hectare claim was staked to cover a group of historic granite hosted uranium occurrences 10 kilometres east of Whitewater. This property has been named Whitewater East. The showings are spread over an approximately 500 metre by 250 metre area and have returned several grab samples greater than 1% U3O8, with the highest grade being 3.53% U3O8 from strongly hematized and sheared granites and pelites. Only two historic drill holes have been completed at Whitewater East, with neither intersecting significant uranium mineralization, however the limited number of holes drilled leaves many untested targets on the property.